A place to rediscover human potential as society is brought to art, and art is brought to society. 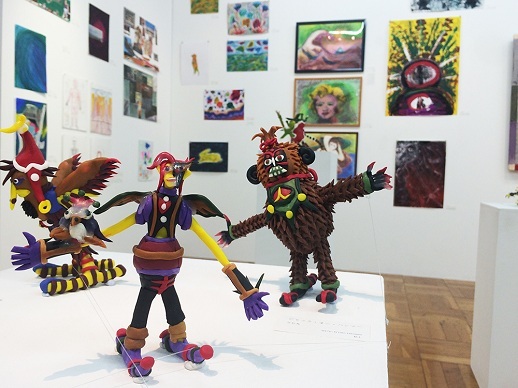 Atelier Pole Pole, launched in 1995 by the NPO Able Art Japan as a space for anyone of any ability to join in freedom of expression, is celebrating its 20th anniversary with an exhibit at the Setagaya Art Museum which opened on September 29th. The organization’s heart lies in its emphasis on a process respecting differences, building up a wave of energy that bursts forth from diversity. Tokyo Art Beat spoke with Able Art Japan’s Yumiko Shibazaki and Yumiko Nakatani, tracing the last 20 years of the organization’s pioneering work. TAB: Your work is dedicated to promoting creative engagement beyond concerns of ability, but in Japan there is still some lack of understanding about disabilities. By using art as a medium, you are able to create an accessible setting that appeals to a wide cross-section of people. 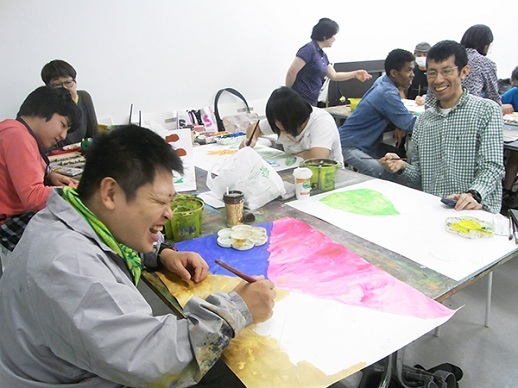 Shibazaki: Able Art Japan was formed through the gathering of artists engaged in the art practices of people with disabilities, staff members from facilities supporting people with disabilities, and several different companies. At the start this kind of art engagement was not really recognized, but the work of the artists had such an impressive impact and supporters had such passion that it attracted a large group of volunteers, and we were able to organize large-scale art exhibitions and broaden the reach of this work. Particularly in Japan, it seemed a principle of the art world to avoid commenting on social issues. From the 1990s, however, there was a shift in people’s values and understanding of art, which began to be accepted not merely as “work,” but also as a tool for transforming environments and ways of thinking. 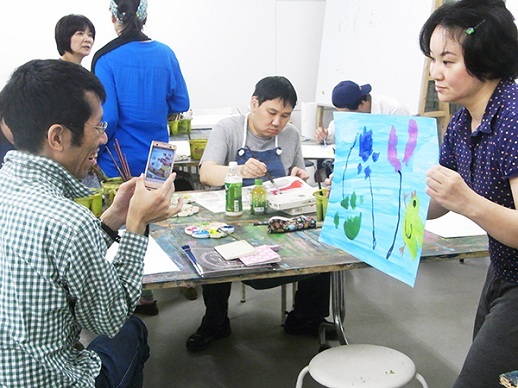 Able Art Japan aims to not only introduce the work of its associates, but by overcoming prejudices and certain ways of thinking about “disability,” it creates a space for people with disabilities to find confidence in themselves as artists and creators. ―― Your motto is “Bringing Art to Society and Society to Art”. Shibazaki: Our main goal is to remove the very category of “disability engagement programs.” We want to reach a point at which even the phrase “with disabilities” also implies a particular value and sense of enjoyment. You might not be able to see it within the work itself, but there are still many hurdles of discrimination and prejudice facing people with disabilities. To overcome such barriers, we intend to use art as a tool, or a “hook” as it were, to grab onto people’s feelings and ways of thinking. ―― You have a 20-year history, but what has changed the most in that time, particularly in terms of the people involved? Shibazaki: The biggest change is that a lot more young people have become involved, realizing for themselves the appeal of the work and its creators, with many young people visiting the galleries and working in support centers. Nakatani: I myself originally had little connection with social welfare or people with disabilities. I had an interest in the work and where it was being made, so I went along to one of the support centers and saw the enjoyment of everyone and I thought I would like to get involved, too. I feel that just over the last two or three years opportunities to see artwork by people with disabilities has really increased. Shibazaki: We have also seen rapid growth in open-call shows recruiting public submissions of work, like 3331 Arts Chiyoda’s Pocorart Exhibition. 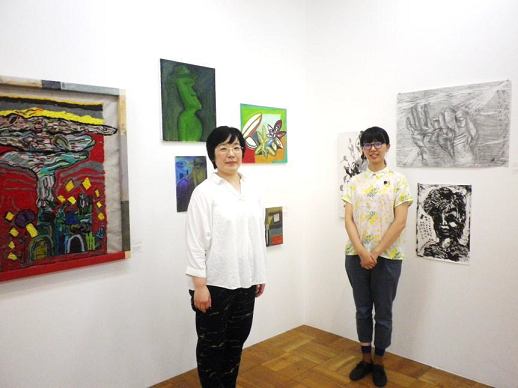 There’s also been a significant rise in specialist galleries outside of Tokyo, and we’re seeing more and more ateliers and studios where people of all abilities can share in expression. 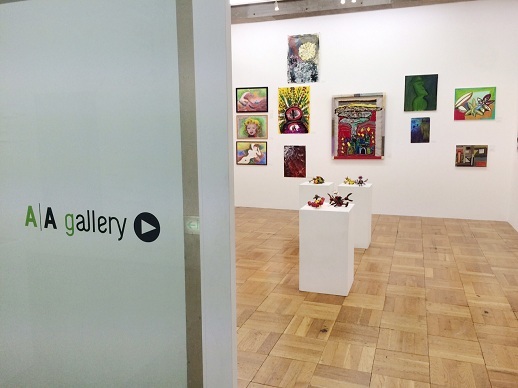 ―― A/A Gallery, which is run by Able Art Japan, promotes and sells the work of artists with disabilities. Does its approach differ from that of other commercial galleries? Shibazaki: Usually people who view themselves as artists are concerned with the storage of their work, its framing, the pricing, contract details, etc. However, many artists with disabilities do not have the possibility of selling their work in mind as they make it. There are of course those who don’t even know about such structures. Ultimately we take on the role of self-promotion for the artist, so we have to work in a slightly different way from typical galleries. We are finally gaining more chances to sell works lately, but of course there is a gap between this wave of interest and the actual environment the artist is working in, so this brings extra costs in terms of time and money. Shibazaki: The approach to art in Japan has always stressed quality and accomplishment, so acceptance for free expression beyond those bounds and the idea of “trying things out” is still very much a challenge. 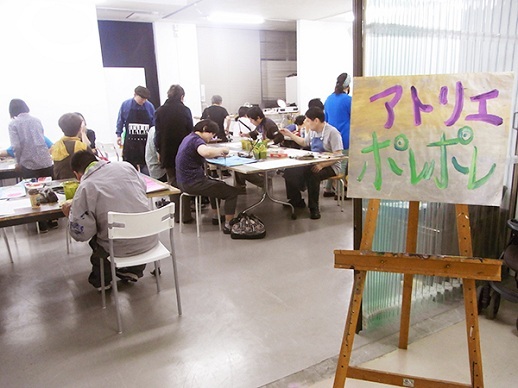 When we first started Able Art Japan, our members also set up Atelier Pole Pole, a space for all kinds of people to gather and to mutually inspire each other. Here each individual can select his or her own pace and approach, while also respecting those of others. Within this space the artist can pursue the creation of artwork, and even his or her own identity over extended periods of time. Since 2005 we have also been running Able Art University, an atelier designed to nurture individual expression and learning in the arts. There are all kinds of participants, including business people and office workers. In this studio people who previously harbored complaints like, “Ever since elementary school I’ve been embarrassed to draw and paint in front of others” have found a safe zone. This is the really great thing about such an atelier – each individual develops at a different pace and along a different path. These differences are the prerequisite for art. ―― What kind of environment can one find in such an atelier? Shibazaki: There is no pressure. You can do something or just watch, it is up to you. Nakatani: There are some people who come and just hang around to start with. You can’t really draw clear lines between participants and staff. Once a month, if the feeling takes you, you can make something. 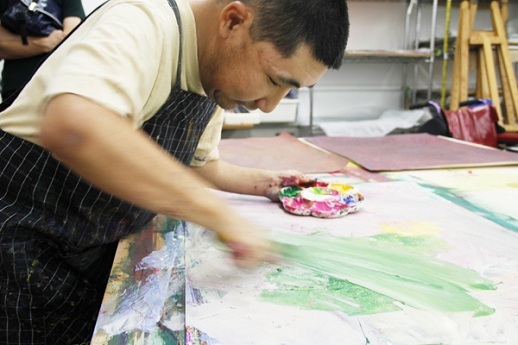 The artist facilitators are also very open, so many of them are working at multiple studios. The atelier could not have continued for these twenty years if not for the interest of the participants. This demand isn’t waning – in fact, it appears to be rising at this moment, demonstrating just how much such a space is needed. ―― Are there any particular challenges you face as an NPO or any particular approaches necessary to run the organization? Shibazaki: Well, of course it is always a challenge to sustain something that is non-profit. The more free art is, the more difficult it is to convert into money. We want to protect this space and philosophy, but we must also find the funds to run our activities and pay the staff. This is our reality. 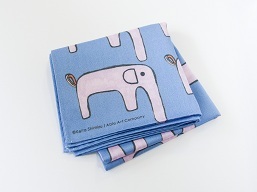 To address this issue we set up the “Able Art Company,” which takes the digital data of artists’ works and handles copyrights to create various products. This approach has really broadened the range of artists we work with. ―― In this way you have collaborated with many different companies, who also seem to be taking an active interest. 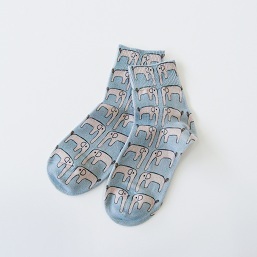 Nakatani: Recently as part of the Challenged Creative Project Felissimo established a clothing brand using the designs of Able Art Company artists. 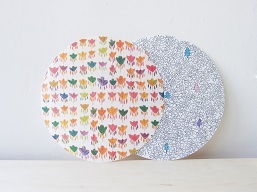 For each item bought 200 yen goes directly to us. ―― Finally, the Tokyo Olympics and Paralympics are coming up in 2020. Are you working on a particular vision towards this? Shibazaki: The cultural program of this event has started to be hotly debated, but Japan is still lacking on many fronts in supporting people with disabilities to actively and independently join this debate and direct it where they want it to go. In Europe and America of course it is obvious that people with disabilities can work as art directors and producers, but in Japan that awareness is still quite low. I think this “big chance to show artists’ works” should be taken rather as an opportunity to support artists with something to say and look towards changing things in the long term. Shibazaki has long been involved in dialogue, creation, career development and regeneration projects with people with disabilities. She has made exploring the social importance of art produced by people with disabilities her life’s work. 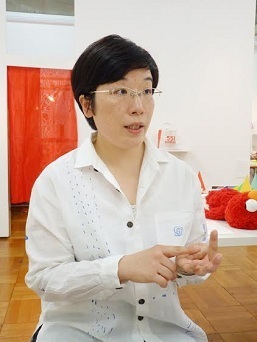 Previously director of the Nara-based “Tan Popo House Art Center Hana,” she joined Able Art Japan in 2007. Born in Nara in 1988. Interested in the power of expression of people with disabilities, Nakatani joined “Tan Popo House Art Center Hana” in 2013. 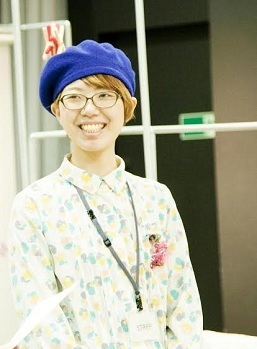 In May 2014 she moved to Tokyo and took on a position with Able Art Japan. Her work currently focuses on artist management as part of Able Art Company.